The other day during one of my meditations I was shown/heard the word ORRIS ROOT. I have vaguely heard of it but don't know anything about it. So I did a bit of research here there and everywhere and in Catherines book about its main purposes. It refers mainly to love and the attracting thereof. Im a bit confused bcs this is not a troublesome area in my married life, so I wonder what else it might be pertaining too. My focus in the meditation had to do with wanting to be more connected to my inner self to bring out my creativity or how to find it easier to be creative as I want to make my own jewellery / craft and eventually open an online shop. can this root help me with this aspect of my life? I wonder why this came to me? Are you a women? because it is known as queen elizabeth root and is a womens root, or a gay mans root if he is more fem. If you are a male then I have nothing for you! In that case yes you can work with Queen Elizabeth root. It is a root that can give women mastery primarily in love matters but in other areas as well . Perhaps get a whole piece of the root, anoint it with some blessing oil or other condition oil that suits your needs and keep it in a red flannel bag on your person. I use a large Queen Elizabeth root as pendulum, when I first got her I anointed it with van van oil. Am I supposed to "feed" it with oil regularly like I do my high John the conqueror's root? If so do I stick to van van or is the psychic vision oil also good for her? I have never used a Queen Elizabeth root for a pendulum. But when a pendulum is used, Psychic Vision is preferred. You can definitely cut it up and there's still potency. Thanks Ms Aida, sorry bout the post, will try not to repeat . The price of 3.00 usd that is in milk colour. I don't know if I'm on a right trick. 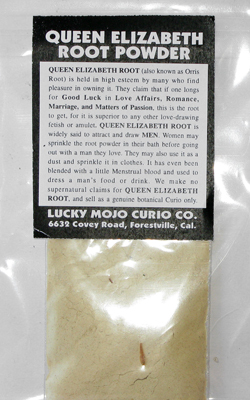 The pure Queen Elizabeth root powder you're describing can be sprinkled in your bath, and you can blend a little with menstrual blood and put it in your target's food to influence him. I answered you the way I did on the other subforum because I thought you were talking about the sachet powder, which is different. But you're on the right track with uses for the powdered root itself. 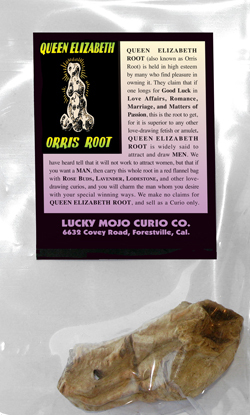 I received my orris root yesterday and it is absolutely alive and smells amazing. Annointing her with the matching oil compounds the scent tenfold. The moment I shook her from the package and into my palm, she told me her name. I looked it up and it means "she who ensares men" Well. Okay then. Haha, that's great! Wish you well in your work with her. I wonder if tying a John the Conqueror and a Queen Elizabeth Root together with red thread would attract a masculine man who is neither macho nor feminine. A sort of middle of the road guy. I have met a few men via dating sites. Most are either a testosterone fountain or prissy. Neither are of any interest to me. Also, in the future, please do not use abbreviations. I have edited your post to show the full names of the roots. Sorry if this has been asked before--I am new to these forums. Theoretically, could a bisexual woman use both Elizabeth Orris and John The Conqueror roots together if she is doing a spell to bring love into her life-- but would be open to either gender? Likewise, for a bisexual man? I am an herbalist and a happily married bisexual woman, so this is purely for intellectual curiosity. Yes, I think you could work with Queen Elizabeth root and High John the Conqueror root in such a way. And then you'd want to word the petition carefully, such as, "Bring me a man or woman with these qualities, etc." I received this powder today and have used it to dress a candle, but am wondering if adding it to my Follow Me Boy mojo bag (or sprinkling some onto it when I feed it with oil) would give it a boost? You ought not open that Mojo Hand to add anything to it once it has been fixed and closed. I bought Queen elizabeth root and queen elizabeth oil. I was wondering if I could use it as "female empowerment"? How can I use it for best effect...Should I make a mojo and what should I include inside? Yes you can use orris root for female empowerment--it's often used for that purpose. I'd recommend you scroll up through this thread to get ideas for spellwork, and if you have questions after that, you're welcome to ask. Anyways I got my root because I listened to an archived lucky mojo radio show, and I wanted to work on myself to feel more confident and empowered! And omg, for some reason since I have carried this root on me, I feel as if my neck is longer! I know it’s not possible but I feel confident, and I stand up straight! I’m so thankful coz I needed something like this after my breakup, I’m hoping next time I see my ex, he can see how I’m feeling, and he can see I took my power back from him. If and when he sees me... can he be drawn to me? I purchased a Q E root half a year ago. I haven't used it yet. I checked it a few days ago and I noticed brown, greenish dark spots on the root. Is it how some of them looks like or could it be mold? I tried to scratch those spots but nothing comes off, but it looks quite "moldish" with brown powders in the bag. It's new and I've always kept it in the bag untouched in a cool dark place. Roots and herbs, like all products of nature, decay over time if kept in contact with air. We advise clients to use them fresh, not let them sit around unused. If it is mould, and i may well be, then you should just bury it in nature and acquire a new one.